Hello, my dear friends and Mac users! Today, the main topic will be Mac’s battery, that is a matter of disputes between many of us. Surely, it was perfect, if a battery could live forever, anyway, the reality shows us that its final time may come in a short time. It is a pity! Any battery as a consumable element has its own life span, the efficiency of which is determined by the limited number of cycles. Various Apple batteries have their own limits and their charge cycle counts are also different. However, this situation doesn’t mean that you can’t help your MacBook battery last any longer. The right attitude can help to prolong its life, so you’ll be happier and your Mac will be able to work longer. I want to share with you some useful ways that will improve MacBook Pro battery performance, even if you’ve already used it for a rather long time. Despite this, it would be fair to expect some battery functionality decreasing, if you’re buying a used MacBook’s battery. You never can know exactly how the previous owner used it. How to Define One Battery Charge Cycle? Using your MacBook, you run the battery through certain charge cycles. One such cycle equals the fully used battery power. By the way, one single charge is not the same as one charge cycle. It could take several days. Let's say, you’ve only used a half of MacBook’s charge per 1 day in such a way that it reached its fully charge only the next day. It will be considered one completed charging cycle, if you’ve also use a half of the charge level the next day. As you might think at thirst, it should count these charges as two ones, if they were charged two times, but it’s not. Thus, summing up half the charges equals one complete cycle lasted for couple of days. To finish the one cycle, you can use the MacBook battery resources more effectively and control the process much better. MacBooks developed in the recent years since 2009 have a 1000 battery charge cycle. This applies to such models as MacBook, MacBook Pro and MacBook Air. Older machine versions have a smaller charge cycle with a 300-500 battery limit. More detailed information for each type of MacBook you can found on the Apple website. You should test the cycle count to change your battery within the best time. 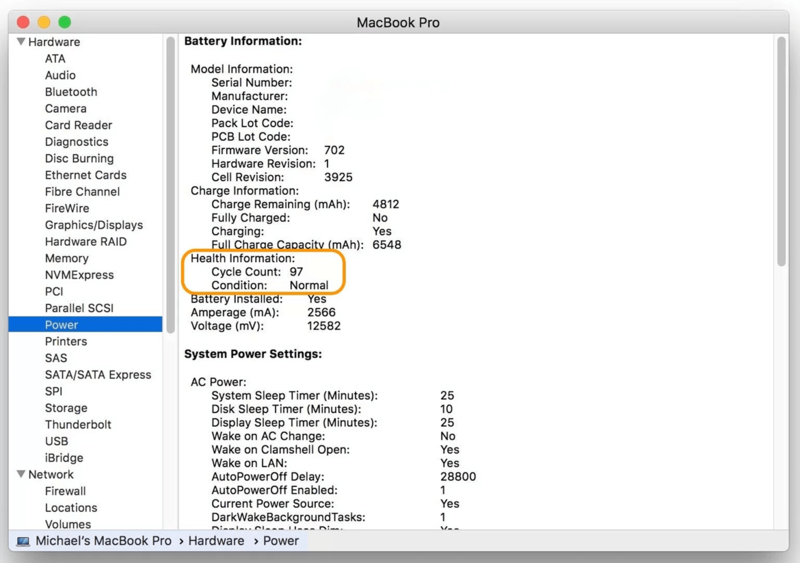 So, a bad battery will not negatively affect the performance of your MacBook. It's also a good idea to know what battery will be most suitable for your MacBook version. It is highly important to use the MacBook’s battery resources more properly, which means following the most effective rules. Your battery will last you much longer, if you make fewer cycle counts per day and per week. This means you should use the following recommendations that will preserve your battery power. Turn off all peripheral devices if you’re not using them now (memory cards, USB flash drives, external drives). You can check the battery preferences once more. Go to the menu bar to find the battery icon and move to ‘Energy Save Preferences’. The battery life span will be longer with the ‘Automatic graphics switching’ turned on and any other applicable options. To find more about Macbook’s batteries go to Apple’s official site. How to Choose a Charger? Of course, you should use a charger specially designed for MacBooks. At the same time, try to experiment with using other compatible chargers with a higher battery wattage. Although, remember that MacBook charging will last long and slow, if you use a charger with a lower wattage. The best way is to follow Apple’s instructions. How to Replace a MacBook Battery? 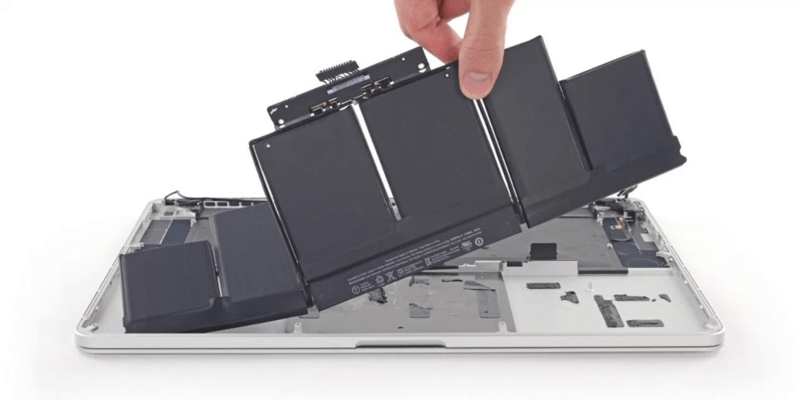 You can use an AppleCare coverage as well as a MacBook’s warranty to cover the battery replacement. However, it depends on different circumstances which caused it. As a rule, Apple requests from $129 to $199, if it’s not included into the original warranty package. One of the fastest and easiest ways to solve all the battery problems is to contact the Apple Support or Authorized Service Provider. There is no information that would be extraneous when it comes to the ways of conserving MacBook’s battery power. Note: in case you have a replaceable battery dated 2008 year or even earlier MacBook version, it’s better to use a more modern battery from other company, because Apple has limited developing of those. I hope this article was helpful for you and you’ll surely apply all these tips to optimize the MacBook’s battery cycle count!